Buying organic can be SO overwhelming. And expensive! We completely understand. Not everyone can afford that. Here are some tips in making these decisions for yourself and your family! 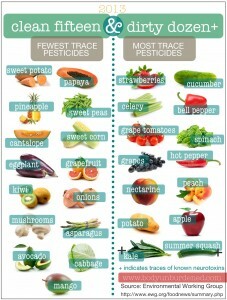 “The Dirty Dozen” is a list of the top 12 fruits and vegetables that have the most trace pesticides on them. This could be due to their locations, their lack of protective skin or the amount of pesticides sprayed on them or the ground they grow in. This list is a GREAT place to start when buying organic food. “The Clean Fifteen” on the other hand, is a list of 15 fruits and vegetables with the fewest trace pesticides. These aren’t necessary to buy organic due to their lower levels of chemicals found on them. This is a little “Cheat Sheet” to use when going to the grocery store and making your way through the produce aisle!